The Ohio State football team didn’t spend long basking in the afterglow of its Rose Bowl win, before turning the page to the 2019 season. The Buckeyes started their official offseason conditioning workouts Thursday, marking the start of the new team year. OSU says ‘approximately 105’ players took part in conditioning work or rehab exercises. Seven new Buckeyes, including transfer quarterback Justin Fields and the six early enrollees, are also already hard at work. 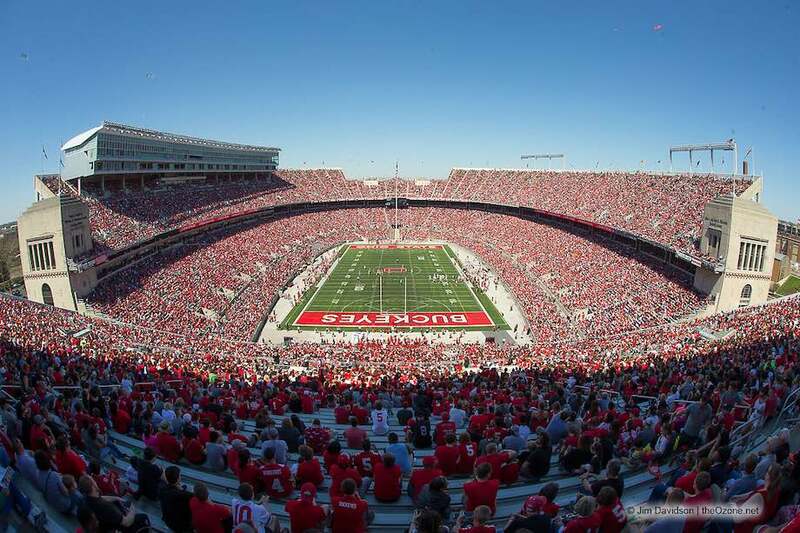 Spring football will start the week of March 4, and the 2019 Ohio State Spring Game date is set for Saturday, April 13. You can read the full release from OSU below. COLUMBUS, Ohio – Mick Marotti, Ohio State’s assistant athletic director for sports performance, met with members of the 2019 football team Wednesday for a briefing on the upcoming winter workout season, and then he got them started in the weight room and indoor field Thursday and Friday for their first two days of official team conditioning and training of the new year. Approximately 105 players took part in either conditioning drills or rehabilitation exercises, including 31 players who will be seniors in eligibility this fall. The senior class includes 14 fifth-year seniors with nine of those players having started a game or games for the Buckeyes: OL Joshua Alabi, CB Damon Arnette Jr., TE Rashod Berry, OL Branden Bowen, DL Jashon Cornell, DT Davon Hamilton, WR K.J. Hill Jr., LB Justin Hilliard and DT Robert Landers. 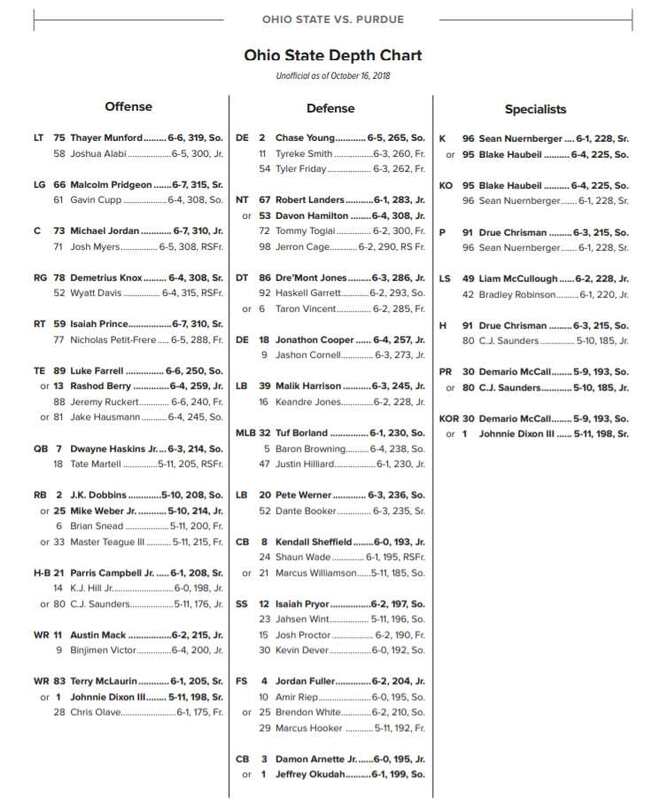 Ohio State’s roster returns a combined 158 starts on defense and 82 on offense with a total of 13 players who started most if not all last season. Leading the way on offense will be RB J.K. Dobbins with 26 career starts and he’s followed by WR Austin Mack (19 starts), OT Thayer Munford (13) and TE Luke Farrell (10). Other offensive players with multiple starts are Bowen (6), Hill (4), Berry (4), WR Binjimen Victor (3) and OG Wyatt Davis (2). The linebackers lead the way on defense with 51 combined starts, including 20 for Tuf Borland, 14 for Malik Harrison and 13 for Pete Werner. Baron Browning has started three times. The secondary has a combined 68 starts with SAF Jordan Fuller (26) and Arnette (25) the most experienced. SAF Brendon White started the final six games of the season last year and SAFs Isaiah Pryor and Jahsen Wint have seven and two previous starts, respectively. The 2019 spring roster includes seven new Buckeyes. Justin Fields is a transfer quarterback who spent his true freshmen fall season this past year at the University of Georgia. He is from Kennesaw, Ga., and Harrison High School. Winter conditioning continues into March, when spring drills start the week of March 4. Spring break for Ohio State students is the week of March 11-15. The spring game is April 13.